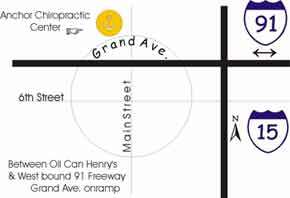 Anchor Chiropractic Center is located at 90 West Grand, #103 (between Main Street and the west bound 91 Freeway Grand Ave. onramp). We are open from 10:00am - 12:30am and 3:00pm - 7:00pm on Mondays, Wednesdays, and Fridays. We are open on Tuesdays from 3:00pm - 7:00pm. If you have any questions, feel free to contact us. 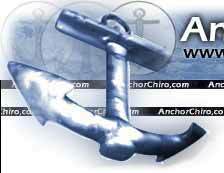 You can call us at (951)549-6808.